Do you need a outdoor banner or flag to place outside your store? Do you attend a lot of events and want to capture the attention of all of the passersby? These displays may be just what you're looking for. There is a huge selection of feather, blade, swooper, rectangular and flutter styles to select from. Event fixtures, and other stands have large display areas that allow for large custom printed artwork. Buy one of these advertising stands with a full-color sign to display your advertisement in vibrant colors. 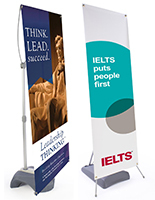 We sell a banner with a rugged stand to add to the overall stability of the unit. Exterior-rated advertising offers a great opportunity to promote your business in sporting events, fairs, or just outside of your business. This flag works especially great when placed on sidewalks or just outside of your store to draw in business. Although marketed for outside use, these stands work equally well indoors. Along with the custom flag for sale here, there are also pre-printed displays available. Choose from such wording as; open, sale, welcome or pizza. These "stock" items ship same day when in stock! This flag banner will attract the attention from traffic passing by, as well as keep customers informed of your store's status. Some of the newer products currently added to this line-up are the street pole signs, and pop-up units. 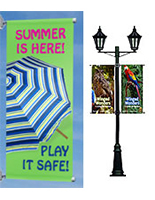 Use lamp post banners to advertise an upcoming community event. Golf tournaments are a common venue that regularly uses these pop-up advertising ovals. These unique flags come in two shapes; oval and rectangular, as well as several sizes. These popup displays practically set up by themselves, and require no tools for assembly. Shoppers will find such fixtures as giant overhead hanging signs, retractable stands and many other advertising options. Are you shopping for a graphics display for an upcoming event? Maybe you just want to increase awareness outside your retail store? Get your advertising outside with this banner where it will be seen by more people. These fixtures, like event displays and poles, are designed to withstand wind and mild weather conditions. After a year of continual use many of the advertising merchandise seen here will show little to no fading or wear. An outdoor rated display will also be more resistant to water and snow. Some of these sign stands, such as event displays, have rugged bases that can be filled with sand or water. This prevents the banner flag from blowing over in moderate winds. All of these outdoor event fixtures are offered with custom printed art supplied by the consumer. Choose from with several print options such as silkscreen, or digital printing. There is also single sided or double-sided printing available on most of the merchandise shown here. 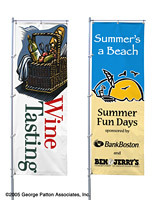 Choose a banner in one of the following styles; feather, bowhead, or basic rectangular shapes. Some of these smaller units also come with a ground stake and base options to allow for placing on pavement or in the ground. Want to make a big impact at an outdoor event? 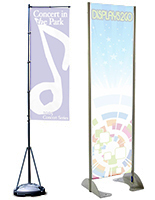 Use this stand that's over 17 ft. tall to stand out above the rest of the vendors! For storefronts and smaller venues, these custom printed feather or bow head shaped units might be more suitable. No matter what type of event or outdoor function you're attending, there are banners for sale here that will attract the attention of the crowd. Many of these merchandise ship in 10 business days or less with custom printed graphics! 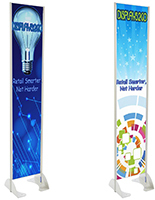 Buy these displays to increase your visibility at an outdoor event or convention. 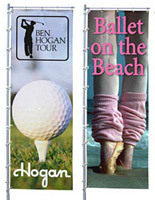 The GiantPole fixtures are a great way to get your advertisement seen over a large crowd. The smaller TriPole flags are great for closer advertising on sidewalks and in front of stores. If you are looking for something different, we have a large selection of stands and printed graphic displays. If you have not seen what Displays2go has to offer, then you are missing out on thousands of in stock display products. We are a leading manufacturer and reseller of POP Displays, Trade Show Exhibits and Retail Fixtures. We keep most of our products stocked so they can ship readily, most within 24 hours of placing your order. What's the turn around time for outdoor banners? Most of these outdoor event products are shipped out in a week or less. For displays that are ordered in bulk quantities there may be a slightly longer lead time, however the majority of the large orders still ship in less than 10 business days. For further questions regarding lead times, please read the product page, or contact a member of the art department for further clarification. What other types of banners are for sale here? There are several other types of outdoor displays for street poles, golfing events, as well as pop-up booths, and much more. 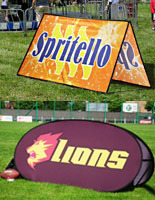 These flags are just a small sampling of fixtures that are commonly seen at festivals, conventions and sports shows. Most of these outdoor event displays include custom printed graphics. 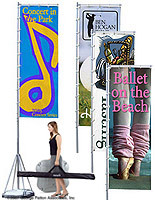 In banners shown on this page there is an even larger selection of outdoor event fixtures for sale here. The complete line of products includes; pop-up booths, street pole banners, custom advertising signs, and much more. 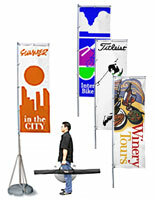 Along with all of these outdoor flags, banners, there is an impressive selection of point of purchase products. Some of these product lines include; roll up banner stands, tradeshow accessories, retail sign holders, and custom printed advertising umbrellas just to name a few. Need some marketing ideas? Visit the main page for a brief summary of some the more popular display products for sale here. This company has been doing business for close to four decades, and continues to flourish and change with the times. What began as one man's side job of producing simple acrylic fixtures and then selling them to local banks and businesses, has now grown to become one of the country's leading POP display providers! Now, with more than a hundred and fifty employees, and three facilities filled with nearly two million units, this corporation is one of the most trusted sources for selling quality objects. By maintaining such a large inventory; lead times are kept to a minimum; in most cases, shipping the same day an order is placed. For requests that are processed before 3PM, in stock objects ships the same day. For the orders that are received after the cutoff time, the orders ship the following business day, or within the specified lead time where applicable. Here at Displays2go, the consumer always comes first! We thank you for your patronage, and look forward to serving you in the near future.